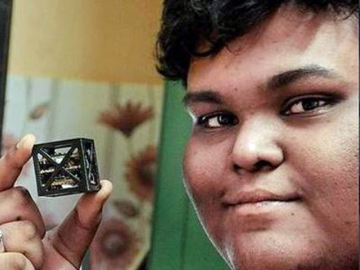 Eighteen-year-old Rifath Sharook, a resident of the comparatively unknown town of Pallapatti in Tamil Nadu, India, is all set to break a global space record by launching the lightest satellite in the world, weighing a mere 64 grams, this according to the Times of India (TOI). The satellite, called KalamSat, will be launched by a NASA sounding rocket on June 21 from Wallops Island, a NASA facility. This will be the first time an Indian student's experiment will be flown by NASA. Speaking to TOI from Pallapatti, Rifath said it will be a sub-orbital flight and the mission span will be 240 minutes — the tiny satellite will operate for 12 minutes in the micro-gravity environment of space. The main challenge was to design an experiment to be flown to space which will fit into a four-meter cube weighing exactly 64 grams. "We did a lot of research on different cube satellites all over the world and found ours was the lightest," he said. Rifath said the satellite is made mainly of reinforced carbon fiber polymer. "We obtained some of the components from abroad and some are indigenous," he said.